← Want to “BEE” prepared? Find out how on Saturday, May 21st! 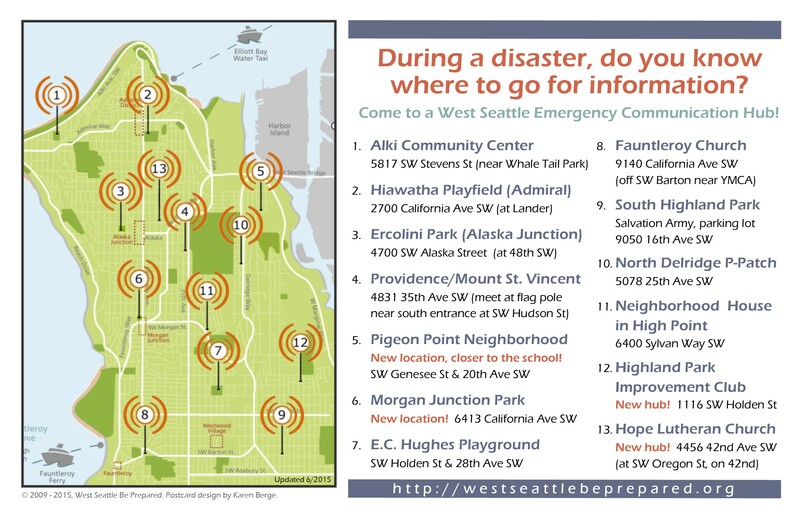 West Seattle Be Prepared will take part in Cascadia Rising, a citywide emergency communications drill on Saturday, June 11, from 9:30 to 11:30 AM. Would you like to watch or participate? We plan to activate our emergency communication hub in High Point, which is located just behind Neighborhood House at 6400 Sylvan Way SW, Seattle, WA 98126. You can watch how we would communicate with other emergency hubs and preparedness organizations around the city during a real emergency. You can also show up to be a “citizen actor” and help test our skills and capacity to handle emergency situations! Attached are two flyers with more details about the Cascadia Rising Drill. 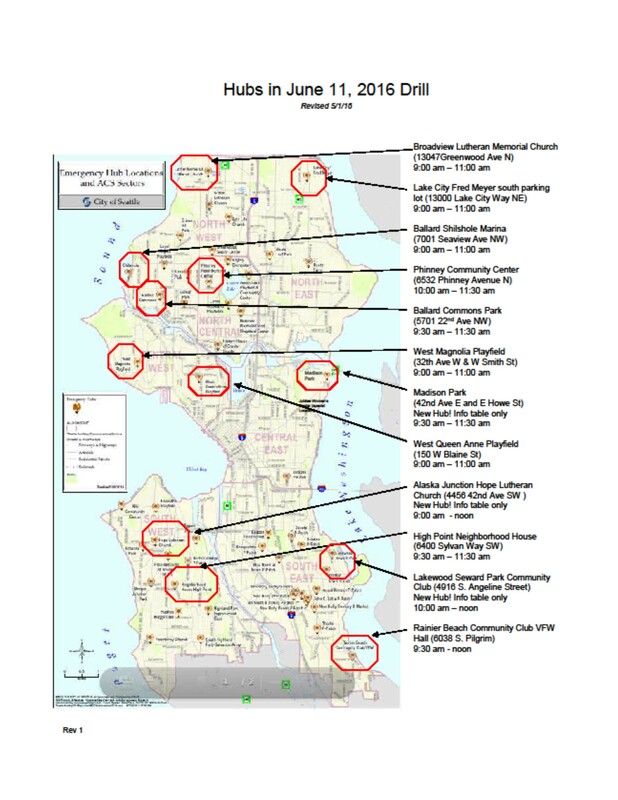 Below that, is our map of all of the West Seattle Emergency Communication Hubs. 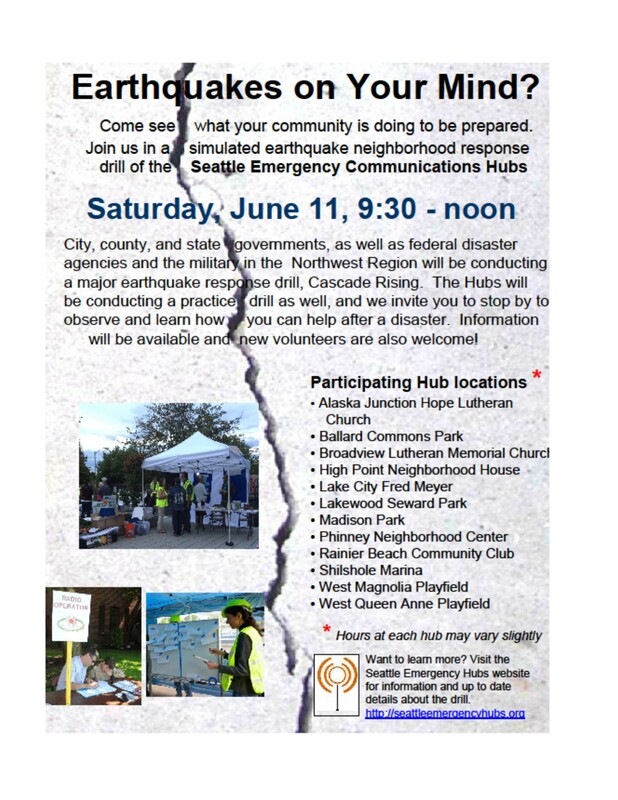 Concurrently with the drill, our hub at Hope Lutheran Church will have an informational table set up. This entry was posted in Announcements, Earthquake Preparedness, Events, Radio Drills & Field Exercises, West Seattle Be Prepared and tagged Cascadia Rising, disaster preparedness, earthquake preparedness, emergency communication hub map, radio drill, West Seattle Emergency Communication Hubs, West Seattle emergency preparedness. Bookmark the permalink. 1 Response to Join us for an emergency communication field exercise on June 11th! As a Highpoint resident, I appreciate and thank, those who participated in this exercise today. While I know some about emergency preparedness, I learned a bit more. I took notes.